Inspired and tested by professional chefs, this easy to use two-sided whetstone will help keep you safe in the kitchen by maintaining a sharp edge on all your knives. Use the coarse #1000 grit side to shave away the dull edge and then flip over to use the ultra fine #6000 grit side to finely buff out an extraordinarily sharp edge. DOUBLE SIDED: 1000-grit side is perfect for duller blades and setting the edge. 6000-grit side is exceptionally fine-ideal for refreshing or finishing a razor-sharp edge. The versatile sides allow for the sharpening of all types of blades from scissors and pocket knives to samurai swords. 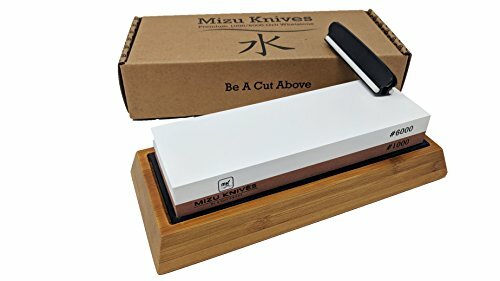 MIZU PROMISE: Feel free to use our whetstone with a 100% satisfaction guarantee. As a local business in Southern California we stand behind our products and are here to help you with any questions you may have. If you have any questions about this product by Mizu Knives, contact us by completing and submitting the form below. If you are looking for a specif part number, please include it with your message.